The heart of 4-H is in its Clubs. 4-H Clubs are comprised of 4-H Members and trained and screened Volunteers who act as Club Leaders. The Club decides on a topic of interest and through instruction by Leaders, and hands-on learning, Members learn about the topic during 4-H meetings. In addition to gaining a hands-on education, Members develop leadership skills, they gain an understanding of how an individual can affect their community and country, and they make lasting friendships. To supplement learning that occurs at the Club level, 4-H provides provincial and national opportunities to enable Members to further expand their knowledge and horizons. Various camps, conferences and exchanges are available for 4-H Members and volunteers. The first step to start your year in 4-H is to choose a project. Learning new skills, making things, and visiting places with friends are all a part of a 4-H project. Members can take one project or many projects. For first-year members one project is probably enough. Make a list if the projects that your club offers that interest you. Give some thought to the projects you have listed. Do they match your abilities? Do you have the time, money and equipment to complete the project? Talk to your parents and 4-H leaders; they can help you choose a project that matches your needs, ability and resources. 4-H clubs hold general meetings each month. All members should attend general meetings. This is where we get together as a club, share information about things that will happen, review projects, have a challenge, etc. Parents are encouraged to also attend the general meetings. This is especially important if you are new to 4-H.
Members choose between a variety of life skills projects like sewing, crafts, photography, heritage, scrapbooking and/or livestock projects such as dairy, beef, light horse, sheep, dog, poultry and goat. Choose something that interests you, or that you would like to learn. It is recommended that first year members choose 1 or 2 projects only. Project meetings are usually held once a month (sometimes more when needed to complete project requirements). Project meetings can be 1 -2 hours long, maybe a field trip, etc, but are always hands on. Project meetings are scheduled by the project leader and you will be notified by email. If you are ever in doubt – call your project leader. Each project has its own requirements – every member will receive a project newsletter and your leader will ensure you cover what is necessary. Life Skills projects usually begin in November, while Livestock projects typically start later in the 4-H year, as they are busier in the spring/summer months. What else will you do as a new 4-H member? For each project, you will need to keep a notebook to record meeting dates, a brief summary of what you did and learned, as well as a record of any costs (if any). At the completion of each project, you will complete a record form. Public Speaking is a requirement for all 4-H members to complete. Each member is required to do a speech or a demonstration at Club Rally. Club Rally is a fun day, even for those members who are shy. Speeches are given before a friendly panel of judges, your peers and parents. Speeches are usually about 2 minutes long for junior members and they can be on any subject (HINT: Pick a topic that you know about or interests you – if you have a favourite pet, you could do your speech on your pet). Younger members learn from watching older members and we see a wonderful progression from year to year! In addition to project work, achievement day, exhibitions (which can keep members very busy! ), we have some fun activities throughout the year where members can get together. There are various club/county activities such as skating, sleigh rides, tours and community service initiatives (ex. Highway clean up, planting flowers, visiting with seniors, etc.). Members and volunteers of clubs and counties choose the activities for the 4-H year together. 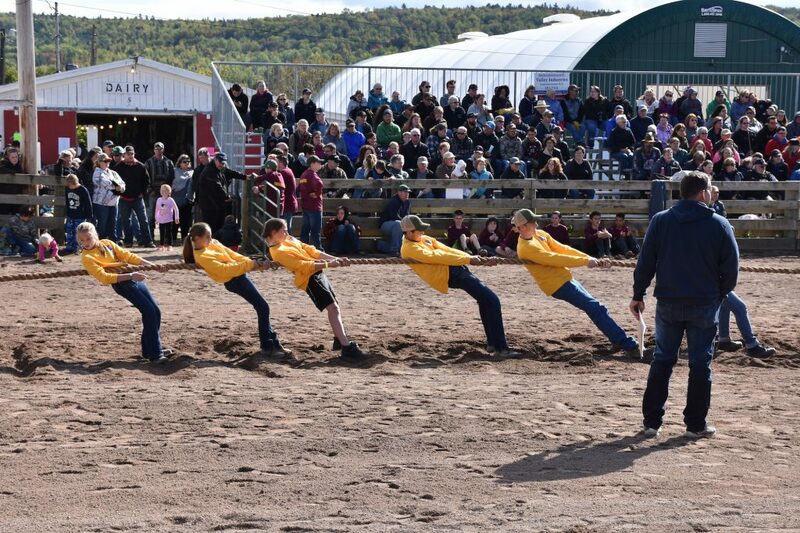 Tug of War practices begin in the spring and go through the summer leading up to the Tug of War Competition at Exhibition and Provincial Show. Our achievement day is held between May and July (each location is different). Achievement day is when our members showcase all of the hard work they have done throughout the year! Members are evaluated non-competitively on what they have learned over the 4-H year. All projects displayed and livestock are shown. All the clubs in the county compete at the local Exhibition. Members are encouraged to participate! Those projects and members who earn a Grand or Reserve Champion standing go on to compete at Provincial Show. Each year we raise funds to help with activities like club rally and other costs. In the past, we have sold chocolate bars. We are always looking for suggestions as to what members might like to do, so if you have something fun in mind, let us know! 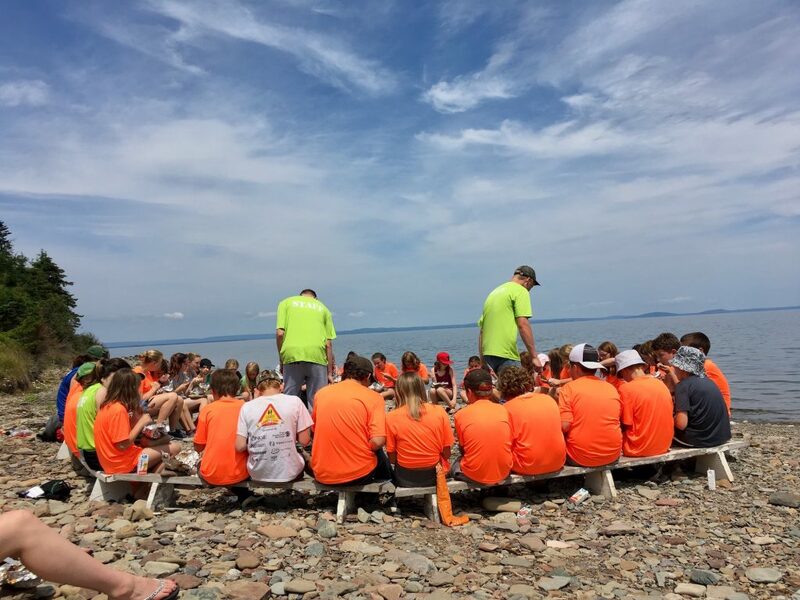 One week 4-H Camps held each year in Cape Breton. From all accounts ,this is a great week of fun and friendship. A bus stops along the route to take campers to and from camp. Lifelong friendships and memories are made during camp! Other than our club activities you can get involved in other 4-H activities, such as 4-H weekend, junior and senior tours, conferences, public speaking rallies, 4-H exchanges for senior members, etc.